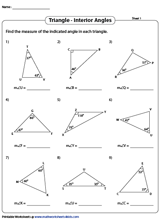 This extensive collection of worksheets on triangles for grades 3 through high-school is incredibly useful in imparting a clear understanding of a variety of topics like classifying triangles, similar triangles, congruence of triangles, median and centroid of a triangle, inequality theorem, Pythagorean inequalities, area, perimeter and angles in a triangle and much more. 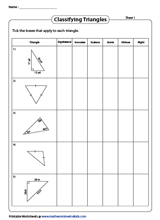 This cluster of classifying triangles worksheets consists of skills like identifying triangles based on the sides as isosceles, equilateral and scalene and based on angles as acute, obtuse and equilateral. 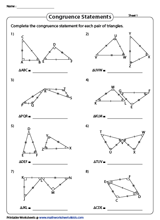 Find exercises to classify triangles offering a mix of angles and sides. Bolster skills with worksheets on finding the perimeter of a triangle with dimensions presented as integers, decimals and fractions. Find the perimeter of scalene, isosceles and equilateral triangles, determine the measure of the sides using the perimeter and solve word problems. Intensify practice with this compilation of area of a triangle worksheets featuring skills like finding the area of scalene, isosceles and equilateral triangles, find the missing base or height, find the area with measures offered as integers, decimals, fractions and algebraic expressions to mention just a few. Featuring myriad exercises, this set of angles in a triangle worksheets help learn the application of angle sum property and exterior angle theorem to find the indicated angles with whole numbers and algebraic expressions. Solve for 'x' and try a set of challenging problems as well. Walk through the median and centroid worksheets offering a wide variety of exercises like finding the indicated length, find the midpoint, centroid, equations of the medians and much more. Packed in this unit of inequalities in a triangle worksheet PDFs are skills to comprehend the relationship between angles and sides of a triangle. Comprehend and apply the triangle inequality theorem, classify the triangles as acute, obtuse or right triangle based on Pythagorean inequalities and much more. The triangle inequality theorem worksheets encompass ample skills like check if the side measures form a triangle or not, find the range of possible measures, the lowest and greatest possible whole number measures of the third side. Also, included are multiple response revision worksheets. 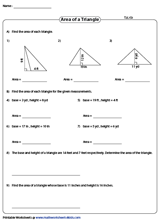 The worksheets on congruent triangles help master the concept of congruence with ease. This assortment provides adequate PDFs on identifying congruent parts such as angles and sides, writing the congruence statement, identifying the postulates, proving the right triangle congruence and more. The similar triangles worksheets provide practice in determining the scale factors, identifying similar triangles, calculating side lengths, writing the similarity statements; finding similarity based on SSS, SAS and AA theorems, solving algebraic expressions and comprehending similarity of right triangles.